There is a longstanding debate about which sport is America’s favorite pastime. Even if you prefer football, it would be tough to argue the impact of baseball’s history on American culture. Here in New York, there is a deep rooted love for the game and its culture. It’s possible that the history of Upstate New York baseball could help explain our infatuation. Now that the thaw has begun in Upstate New York, our teams can finally throw out the opening pitch. 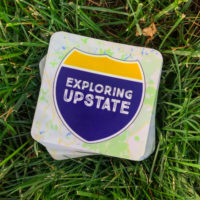 While you’re waiting for your hot dog to arrive, here’s a few interesting facts about Upstate’s deep connection to baseball. Ross Barnes was born in Mt. Morris, New York in Livingston County on May 8, 1850. His major league career started 21 years later in 1871. At that time, he signed with the Boston Red Stockings and bounced back and forth between shortstop and second base. Barnes was a key player for Boston during that time. He led the Association with 66 runs scored and 91 total bases, finishing second in batting average at .401. But, it was on May 2, 1876 at Avenue Grounds in Cincinnati, Ohio that Barnes really hit it out of the park. In a game where Boston beat Chicago 15-9, he became the first person in history to hit a recorded home run during a professional game! The longest baseball game in history lasted 33 1/2 innings and took 8 hours and 25 minutes to play. 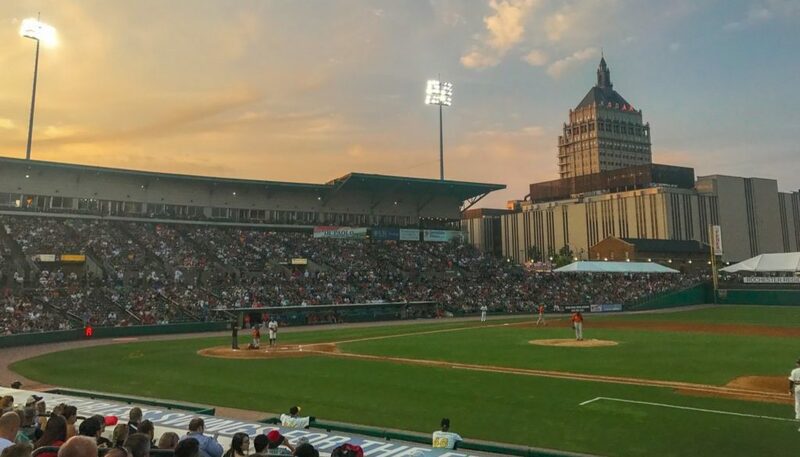 The Pawtucket Red Socks hosted Upstate’s own Rochester Red Wings for a game that’s still talked about in awe. The whole thing began on April 18, 1981, which was the day before Easter. Starting off, the game was delayed for 30 minutes because of problems with stadium lights. Bad lighting was only the start to a long list of oddities the game would experience. At the bottom of the ninth inning, the score was tied 1-1. Typically, a curfew rule would prevent the game from continuing, but the umpire didn’t have that in his rule book. As the game drew on, spectators left, and even some players went home. With neither team drawing ahead, it was forced to continue well into Easter morning. At 4:07a, they finally stopped the game with only 19 people left in the stands and players so exhausted they were delirious. The next time the Rochester Red Wings were in Pawtucket, Rhode Island wasn’t until June 23, when they resumed. Sadly, Upstate can’t claim a win on this game, as it ended 3-2 with Pawtucket claiming the victory. But still, the Red Wings’ legacy is sealed in baseball history as putting up one heck of a fight. 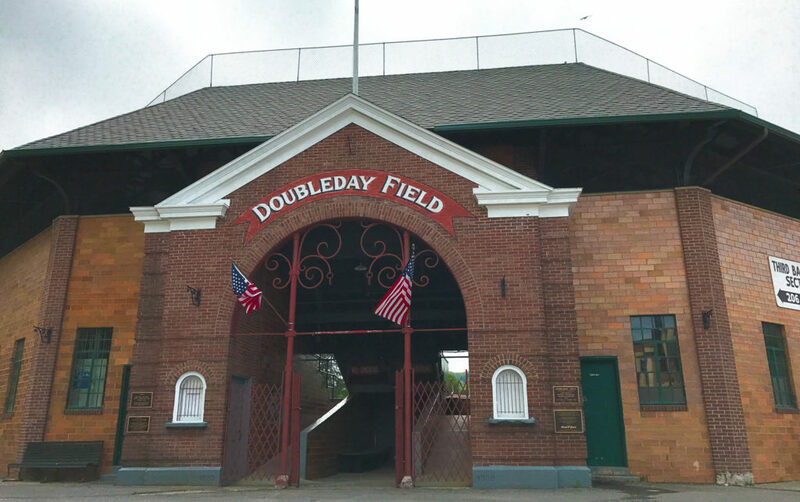 Even the Baseball Hall of Fame describes Doubleday Field as the “widely recognized…birthplace of America’s pastime”. 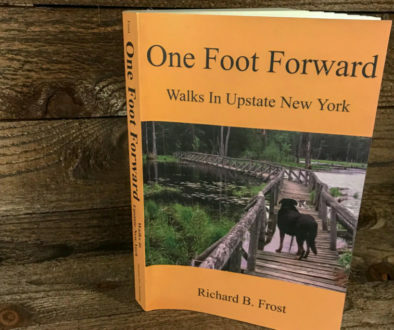 As with a lot of “birthplace” claims, some historians will scoff, but many are in agreement that Cooperstown, New York in Otsego County is home to the invention of baseball. Abner Doubleday was born in Ballston Spa, and later went on to be a celebrated Army officer and a General for the Union during the Civil War. But, before that, he was batting around a ball in 1839 in a cow pasture owned by Elihu Phinney, Cooperstown’s first print shop owner. Doubleday claims he didn’t invent baseball, but the Mills Commission claims he did. 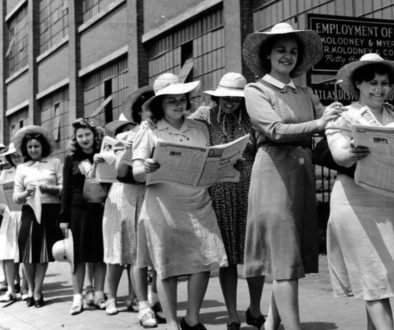 The comission was designed specifically to promote baseball globally, and in an attempt to discover the proper origins of the game, they requested help from the public. A response from Abner Graves of Denver, Colorado claims he watched first hand while Abner Doubleday helped a group of kids in Cooperstown from the Otsego Academy and the Green’s Select School improve upon their concept of “Town Ball”. The Mills Commission ran with it and the story of General Abner Doubleday inventing baseball is the story they sold the world in 1908. 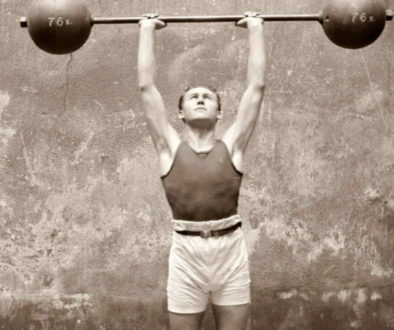 Some believe Graves’ story, and some don’t. Either way, visitors have been seeing games at the famous Doubleday Field in Cooperstown since the 10,000 seat grandstand was built in 1920. And yes, it’s right on the old cow pasture. Patsy Dougherty, born in Andover, New York in Allegany County, went on to be an MLB star. On Friday, October 2, 1903 during Game 2 of the World Series at Huntington Avenue Baseball Grounds in Boston, Massachusetts, Dougherty was playing for the Boston Americans (later, Red Sox). During that game, he became the first player to hit two home runs in a single World Series game, and the first player to hit a leadoff inside-the-park home run in a World Series game. The latter of those accomplishments is a feat that went unmatched until the 2015 World Series. Today, Dougherty is buried near his hometown in Bolivar, New York in Allegany County. Maybe it’s not exactly baseball history, but it kind of is! The very first photograph of someone ever giving the middle finger was a Boston Beaneaters team photo from 1886. 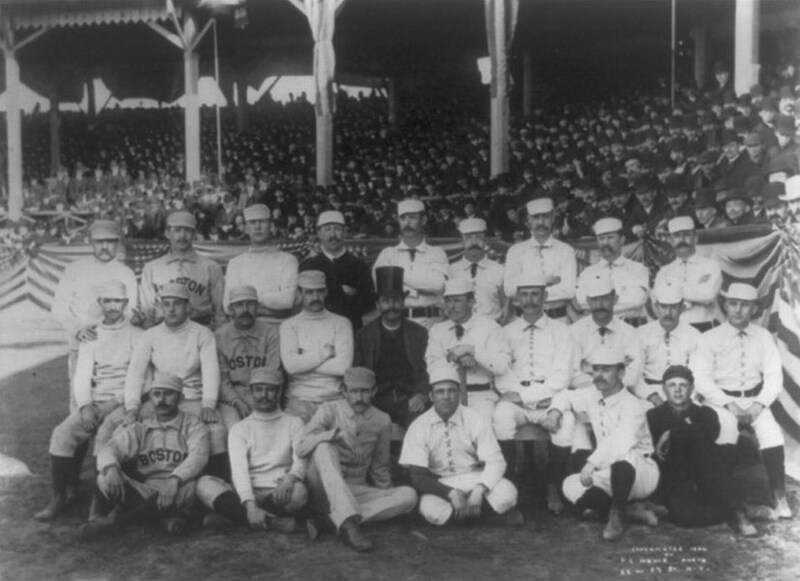 Seen on the left, Charles “Old Hoss” Radbourn appears to be flipping us off. 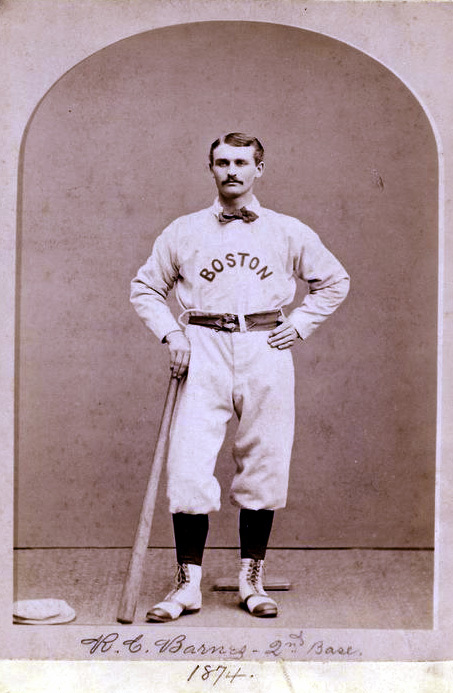 Some critics have scoffed at the claim saying that Radbourn’s middle finger looks too much like a cigar. That claim may have been a valid myth-buster if Radbourn hadn’t gone and done it a second time! So, what’s a Boston Beaneaters team photo have to do with Upstate New York? Charles “Old Hoss” Radbourn just happens to be born right in Rochester, New York in Monroe County. Before his Beaneaters stint, he played minor league ball for the Buffalo Bisons. There are six different professional baseball leagues with teams in New York State. The 1927 Buffalo Bisons were recognized as one of the 100 greatest minor league teams of all time. The JAGs (Johnston-Amsterdam-Gloversville) couldn’t play on Sundays because in the early 1900’s there were laws about Sunday being religious. To get around it, they played on Sport Island, a field in the middle of a lake. With a population hovering around 16,000, Batavia is one of the smallest cities in the country to host a professional baseball team. On October 3, 1951 Bobby Thomson hit the “Shot Heard ‘Round the World”. His home run for the New York Giants helped beat the Dodgers in a playoff game that sent his team to the World Series. Thomson’s home run is one of the most famous ever hit. The bat he used to hit it out of the park that day was made from a Northern Ash by the Adirondack Bat company in Dolgeville. Here’s a few things available on Amazon related to baseball that you might be into. 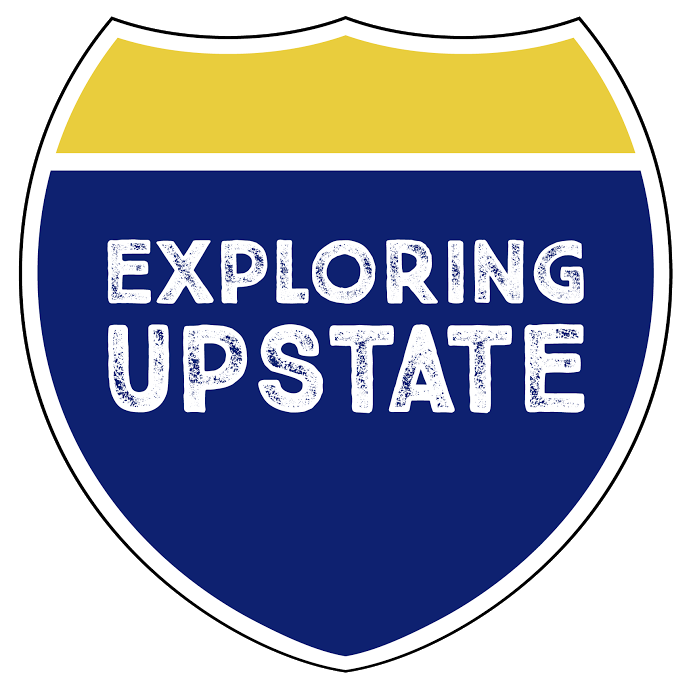 Any purchase of an item on Amazon using a link found on this site earns a few pennies back to Exploring Upstate.